Three Al-Jazeera journalists on trial in Egypt directly asked the judge on Monday to release them, insisting the terrorism charges against them were preposterous. 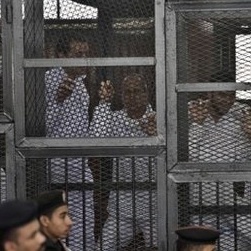 The judge denied the request for bail by Australian Peter Greste, Canadian-Egyptian Mohammed Fahmy and Baher Mohammed during the fourth hearing in the trial that opened on Feb. 20. TVNewser The judge did not accept their plea, adjourning the case until April 10. Australian Broadcasting Corp. It was Greste’s fourth appearance in court after more than 90 days in prison, and in an unusual move he was allowed to directly approach the judge and tell him why he should be freed. In words translated for the judge, Greste said that he had only been in Egypt for two weeks before his arrest and he had no connection with the Muslim Brotherhood. NYT One of the journalists even recounted drinking alcohol, which is forbidden in Islam. It was the first time the journalists were allowed to speak in court, about a hundred days after being detained. All three worked for Al Jazeera’s English-language news channel, and their case has elicited protests from human rights and free-speech groups. Mansour has said in public letters to the journalists’ families that he hoped they were soon released. And for a brief moment on Monday, the judge appeared sympathetic to the journalists’ arguments. CNN International Fahmy told the court that he and his colleagues worked in public rather than in secrecy, and covered Egypt as they would other countries. He questioned how any journalist could be labeled a terrorist. Their lawyers also took up the issue of Fahmy’s health. Fahmy injured his shoulder before his arrest in December. He has complained about not getting proper medical treatment while in prison and says that because of the lack of treatment, he no longer has full use of his right arm. The trial was adjourned until April 10. When March cable news ratings come out Tuesday, CNN will show a vast improvement over last March, likely finishing second to Fox News Channel in several measures. Monday morning, CNN Worldwide chief Jeff Zucker took an early victory lap and thanked his team. Politico / Dylan Byers on Media “On our digital platforms, March was our best month ever for both page views and video streams across our domestic and international desktop sites. And our best month ever for mobile Web traffic,” he wrote. “We will likely have more unique users across our global sites than any month in our history.” FishbowlDC As March came to a close, CNN had been getting some flak for its wall-to-wall coverage of Malaysia Airlines flight 370. But while that mystery has dominated its television programming, other big stories are also getting play online. MashableZucker added that CNN didn’t only see strong traffic in the U.S. International properties also experienced a bump. The memo, however, didn’t outline the extent of the increase or include any figures. The claims by CNN indicate that the patterns of television consumption may mirror Internet traffic. U.S. communications regulators voted along party lines Monday to limit so-called joint sales agreements among broadcasters, deals that allow TV stations to share advertising staff, though promising to respond to any waiver request within 90 days. TVNewsCheck During the meeting, FCC chairman Tom Wheeler said that Congress gave broadcasters the right to charge for their programming and that’s not changing. “All we’re doing today,” he said, “is leveling the negotiating table.” TVSpy The FCC also voted to bar broadcasters from negotiating retransmission deals for multiple television stations in the same market. The Hill / Hillicon Valley Under current FCC rules, a single broadcast company cannot own more than one of the top four broadcast stations in a media market. But prior to the agency’s actions on Monday, a broadcast company could use a Joint Service Agreement (JSA) to control advertising sales across multiple broadcast stations. Critics said it allowed broadcasters to control multiple stations in practice without technically violating the agency’s ownership rules. Poynter / MediaWire The FCC’s new rules will ban JSAs in which one station sells 15 percent or more of the advertising time of another station. The JSAs have become especially useful to stations that could not get FCC approval to outright manage another station in the market.